On Thursday, December 6th. 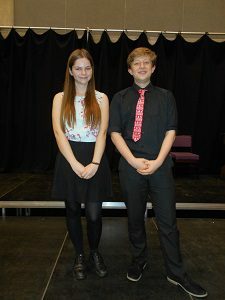 the school’s Drama Department presented An Evening of Drama to showcase the department’s extra curricular activities. The comperes for the evening, Rachel Dunleavey and Nathan Pike, both Year 11 students,introduced all the items on the programme with clever and amusing rhyming couplets composed by the students and much appreciated by the audience. The first part of the evening was devoted to “School Poetry” which consisted of extracts and scenes from Please Mrs Bultler by Allan Ahlberg which portrayed a variety of school scenarios in rhyme. They included Billy McBone, Scissors, Supply Teachers, Dog in the Playground and I’m Sick. Many of the scenes were between students and their teachers with a very funny response from the teacher. All the scenes were performed by members of the Drama Club. After the interval the programme brought a more serious tone to the evening. 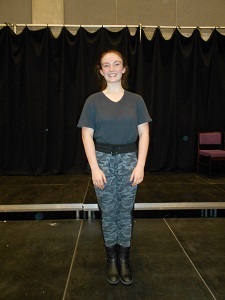 To commemorate one hundred years since the end of WW1 there was a performance of the final scene of Journey’s End by R C Sheriff, directed by Year 9 student Katie Hall who has been a member of the Drama Club since Year 7. This is a very powerful scene which movingly depicts the death of a young officer who had only recently joined the battalion straight from public school at the age of eighteen and the destruction of the trench and dugout, as well as all the personnel. The brutal fighting was cleverly represented by mimed actions. This was followed by what was described by Nathan as the opening and a fight from Shakespeare’s Twelfth Night directed by Rachel Dunleavey , Nathan Pike and Hannah Dowsett and performed by students who originally performed this extract in November at the Harrow Arts Centre as part of the Shakespeare Schools’ Festival. The Glee Club brought the evening to a lively close with a performance of Oh Mama Welcome to the Sixties from the musical Hairspray. 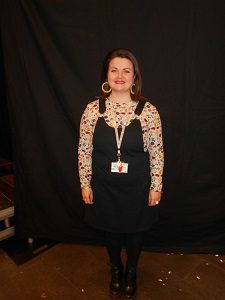 The students were supported by Miss Carroll, the school’s new Head of Drama and her team who will soon be casting and rehearsing for the school’s summer term production of The Addams Family.